All of our jump rings are hand wound and cut. We purchase the coils of raw wire from some of the most reputable sources in the country. The rings are wound onto the appropriately sized mandrel and then they are cut by a very fine-toothed saw. 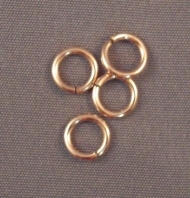 The resulting ring size reflects the inner diameter (ID) of the ring. Finally the rings are tumble polished and hardened. This process lasts between four and eight hours depending upon their gauge and diameter. The rings are then ready to be packaged and sent to the customer. Every batch of rings is closely inspected by hand for quality. Even so, there is always a possibility of an imperfect ring slipping through the quality control process. 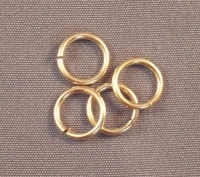 We package several extra rings so that if this occurs you will still have enough for your project. We will always cheerfully replace any rings that are not up to our standards or our customers’ expectations. There is a price break available when ordering in quantities of 5 ounce troy (ozt.) or more. This discount is available when ordering in full ozt. quantities in the same metal. Mixed ring sizes in the same metal can be included in the quantity discount. Our standard method of shipment is 2-3 Day Priority Mail through the United States Postal Service (USPS). If desiring overnight delivery, we will ship Express Mail unless you request otherwise. 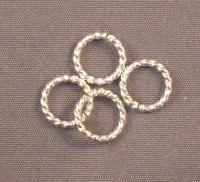 We hope that you will try our jump rings and find that you love them for your chainmaille projects. Please email us any feedback you may have about them. Thanks much and happy chain mailing!